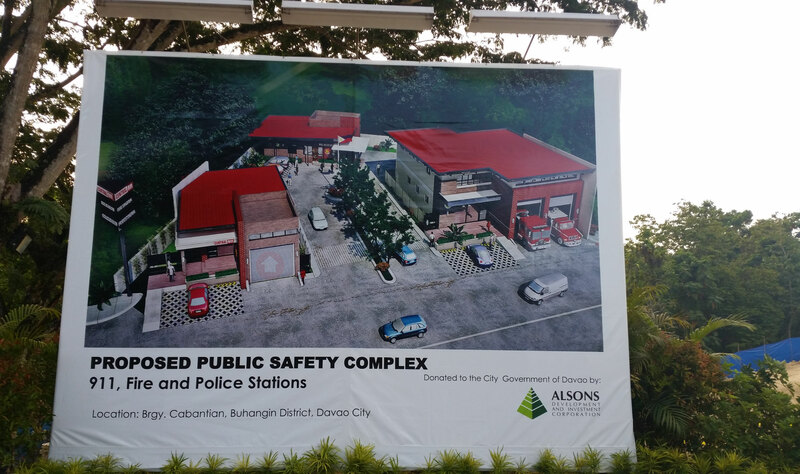 July 17, 2015 marks the groundbreaking and blessing of Public Safety Complex in the doorstep of Cabantian entrance of a premier township development of Davao City — the 116 hectare Northtown Subdivision. It is an all-in-one government safety and rescue facility that will house rescue 911, police and fire stations in 1,970 square meter property owned by Alsons Development & Investment Corporation, the parent company of Alsons Properties — the developer of Northtown, Northcrest, Ladislawa Garden Village, Woodridge Park, Las Terrazas, Fernwood, Edenridge and Woodlane Subdivision. The land including the buildings for 911, police and fire stations will be donated by Alsons Development & Investment Corporation to the city government of Davao, as part of their commitment is to donate one unit ambulance with the Central 911. The design and features of each building are based on the specifications and standards set by each government agency. The Central 911 will have 24-hour medical and rescue team, infirmary room and clinic, radio room, sleeping quarters and one ambulance. The Community Police Assistance Center or also known as COMPAC will ensure a 24-hour security and safety of the area of Buhangin and its neighboring communities. The fire and emergency rescue team will have sleeping quarters and fireman’s sliding hole for fast access route to the firetrucks and equipments. This first of its kind integrated public safety complex in the Philippines will be completed on March 2016. 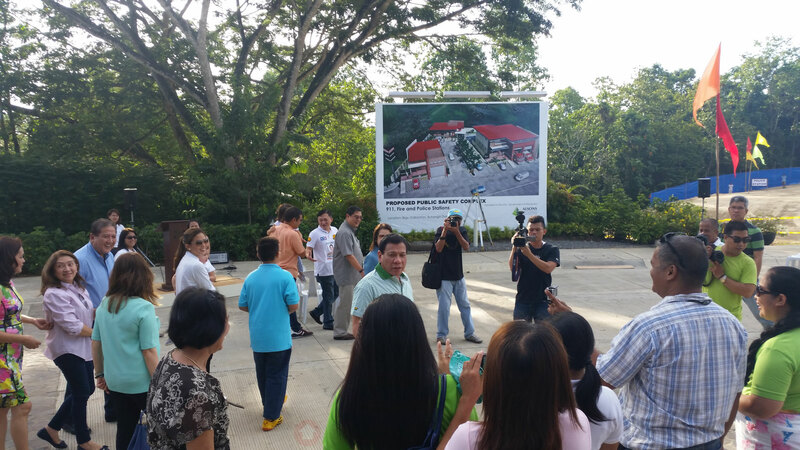 The affair was graced by Davao City Mayor Rodrigo Duterte, 2nd District Representative Hon. Mylene Garcia-Albano, City Police Chief – SENIOR Superintendent Vicente Danao, Jr., Central 911 Chief – Mr. Emmanuel Haldon, the Alcantara family and executives of Alsons Development & Investment Corporation as lead by Executive Vice-President Rosie Alcantara-Dominguez. 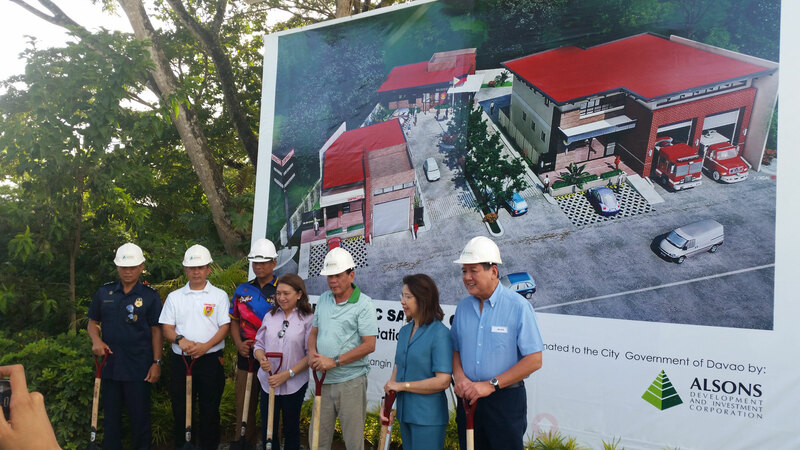 Today’s event marks a special milestone in the fifty-year history of Alsons Development when the break ground of the public safety complex consisting the fire department, the COMPAC police station and the satellite 911 station. Davao City is acknowledged to be the safest city in the country and only surpassed by four other cities in the world. It is also known that the 911 Central Emergency Response Center as the first and the best in the country. And this has become a model for other cities to follow. 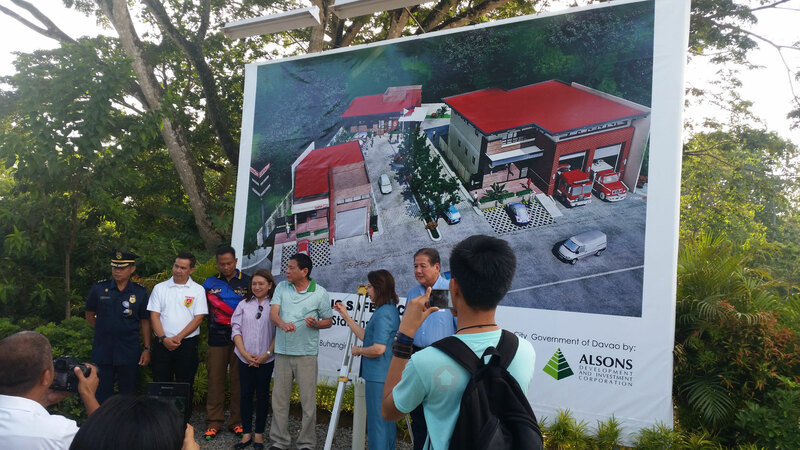 This donation by Alsons Development consist of 2,000 square meters of land and three structures fronting the Cabantian road, you will not see any fence – to make it accessible to the public. This donation is our modest contribution to the city’s program for the promotion of public safety and security services to the city of Davao. We thank the Mayor for his untiring efforts and desire to always keep the Davaoeños safe, making Davao one of the most livable cities in the world. 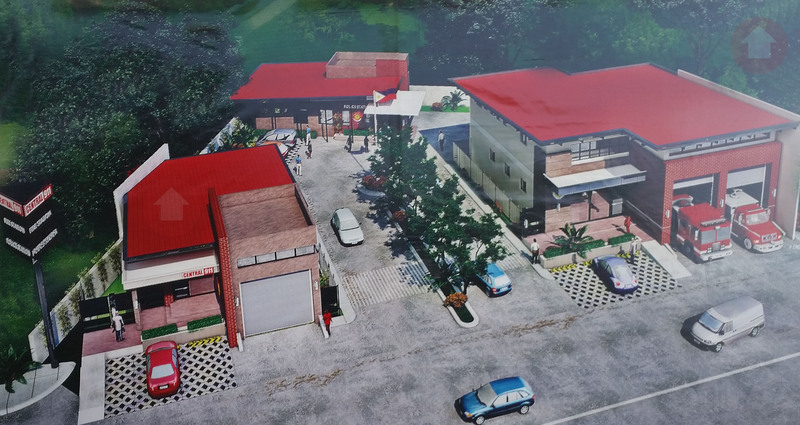 This complex will serve the needs of the Buhangin District the most proximate of which are the barangays of Cabantian, Buhangin, Tigatto and Indangan. Where we stand now is a township that will have 10 hectares of educational, commercial and institutional components. The residential component in the township being Northtown is located to our far right. We are about 5 kilometers away from the nearest fire station and 911 in Sandawa is 18 kilometers away, it is for this reason that we have prioritized the construction of the public safety complex and the first component in the township. As the residential communities in the Buhangin District continue to increase in number, it has become evident that the public safety complex in this area is essential to ensure that life’s emergencies are immediately taken cared of. At Alsons Devt, it is our corporate mission that we become instrument in enhancing the lives of the communities where we operate. In the last 10 years or so, we have built residential developments in Indangan, Cabantian, Buhangin and soon Tigatto. Through the years, our CSR (Corporate Social Responsibility) projects have involved the support to the various public schools in the vicinity, the support to the neighboring parishes and the rehabilitation of roads & drainages of the different barangays where we operate. In behalf of the Alcantara family and the management of Alsons Development, we thank the city and the barangay officials for their support and for enabling us to be part of the growth and prosperity of the city, Davao. We are very privileged to be your partners and we will continue to be your partners in the years to come. What had happened showcased the strong commitment of Alsons Properties and it’s parent company, Alsons Development & Investment Corporation in maintaining value creation of it’s premier township project — Northtown Subdivision. Make the best investment in Davao City by owning a piece of this high-end, exclusive township community. Ask the broker, Davao Realtor — Donato, to learn more about this wonderful project and on how you can reserve your unit here. Leave a comment below if you find this project remarkable.